In the mid-eighties, when I first moved to Suffolk from the flatlands of Cambridgeshire, I found the area around Rendlesham, Eyke and Tunstall quite exotic. For a start, there were the forests, through which the roads cut and in which the villages hide. But mostly, it was the Americans that made it exotic. Woodbridge and Bentwaters were among the biggest American bases in Europe, and to drive along the perimeter fences, gazing in at the houses, bunkers and hangers, was to see a people in possession. Well, the great storm of October 1987 destroyed a million trees in Suffolk, and was particularly cruel to the Rendlesham and Tunstall forests. And the Americans have gone now, leaving empty holes in this district. Their absence is most striking from Wantisden church, where the great Bentwaters base stretches away to the horizon, abandoned and derelict. St Gregory is set in the fields on the far side of the village from the air base, and you would not think that for more than 50 years this village was a virtual garrison town. And you'd think, now, that with the departure of the US Airforce, this area would be settling back down into sleep. But the opposite is true. The former base has been sold for housing, and the population of this village has increased greatly over the last ten years. The former base chapel, dedicated to St Felix, has been reopened as a second church for the parish. And way back into ancient history, sleepiness has never been a Rendlesham habit. St Gregory is away from the village on a backroad which runs off of the Woodbridge to Orford road. Cycling this way from Campsea Ashe on a frosty day in late November 2011, this part of Rendlesham at least seemed a very quiet little backwater. Apart from an upright young lady on horseback I had not seen another living soul since leaving Wickham Market railway station. The road climbs and dips between the rolling fields of the Deben Valley, and I had to remind myself quite how lose I was to the sleeve of the busy A12. Ahead of me, the tower of St Gregory peeped and the disappeared behind the bare trees. On the eastern face, a sanctus bell window can be seen, below the original roofline. It would, of course, originally have been inside. 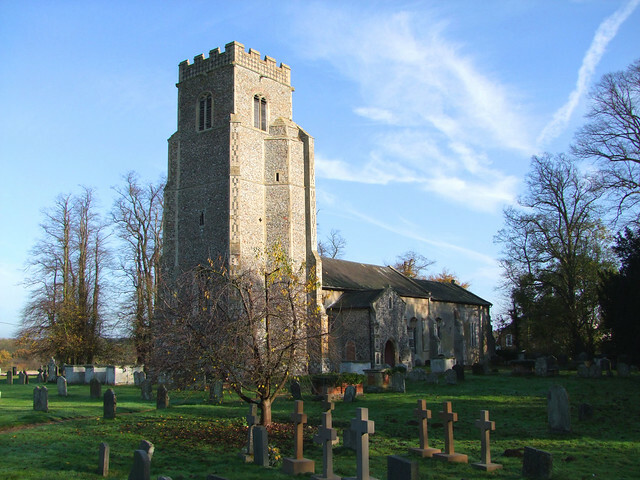 This great tower probably predates many of its grand cousins in Suffolk, perhaps from the 14th century. A later porch stands below it, its upper room lifting it to roof-level. Atour of the outside shows that almost every window is different, as though someone had decided to mount a collection to show a variety of styles. This church is miltantly open every day, both north and south doors, with a proud notice out by the road telling you so. I stepped down into a cool, crisp interior. The winter sunshine seemed to have followed me in. The painted box pews that neatly line the nave are reminiscent of those at Tunstall. The sense of space is accentuated by the way that the chancel has been cleared of clutter, and how good it looks. St Gregory is a perfect setting for an interesting and important group of memorials. The most interesting of these is to Eliza Charlotte, Baroness Rendlesham. Mortlock tells us it is by the Italian sculptor Aristemedo Costoli, and he quotes the criticism (was it by Ruskin?) that his work was skilful in design and technique, but before it the heart remains placid and the pulse is not quickened - the relief shows her floating up to heaven, while beneath her the detailing is like the icing on a wedding cake. It is rather better than that to her father-in-law John, Baron Rendlesham, who died ten years earlier. Fifteen years earlier than that, however, Flaxman's memorial to his wife, flanked by the figures of Pity and Grief, is the best of the lot. A straight path can be traced from here to Sutton Hoo, the royal burial ground, and now an archaeological site of national significance. Perhaps this church itself is on the site of a pagan temple. The story goes that King Redwald was baptised on this very site, later recanting in deference to his pagan wife. Perhaps it was from here that his body set out, to be carried on its final journey to the great ship burial on the hill above the Deben.